According to the Bureau of Labor Statistics (BLS), slips, trips and falls accounted for 16.3% of all the fatal occupational injuries in 2016. The BLS reported a preliminary total of 5,190 fatal work injuries for calendar year 2016. 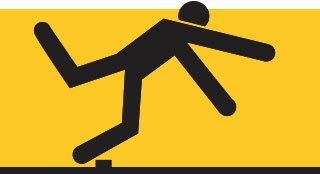 Of this total, 849 were associated with slips, trips and falls. Falls to a lower level accounted for 82% of the fatal falls with falls from 15’ or less making up nearly half of the total. In addition, of the 892,270 nonfatal occupational injuries and illnesses involving days away from work recorded in private industry during 2016, 309,060 of the cases were associated with slips and falls. Falls on the same level resulted in 10 median days away from work and falls to a lower level resulted in 20 median days away from work. The most disabling workplace injuries and illnesses in 2015 amounted to $60 billion in direct workers’ compensation costs, according to the 2018 Liberty Mutual Workplace Safety Index (WSI). This translates into more than $1 billion a week spent by businesses on these injuries. Overexertion injuries remained the largest contributor to the overall burden, accounting for $13.7 billion, or just over 23%, of the total cost. Falls on the same level ($11.2 billion) andfalls to a lower level ($5.9 billion) were the next most costly injury causes, followed by struck by object or equipment ($5.3 billion). The cost of the combined fall categories exceeded that for the overexertion category. The actual cost of work-related deaths and injuries is much greater than the cost of workers’ compensation insurance alone. Per the National Safety Council Injury Facts®2017 Edition, the average cost per death in 2015 was $1 million and the average cost per medically consulted injury was $31,000. The Occupational Safety and Health Administration’s (OSHA’s) General Industry standards for walking/working surfaces are found in 29 Code of Federal Regulations (CFR) 1910 Subpart D, 1910.21 – 1910.30. Voluntary consensus standards are available from the American National Standards Institute (ANSI), American Society of Safety Engineers (ASSE), ASTM and National Fire Protection Association (NFPA). For those looking to get additional information related to the prevention of slips, trips and falls, the National Floor Safety Institute (NFSI) is an organization that’s dedicated to the cause. The NFSI is a non- profit organization that tests and certifies slip prevention floor products, conducts training on slip, trip and fall prevention and develops the standards related to the topic for the American National Standards Institute (ANSI). All of their resources can be accessed at www.NFSI.org.